This was done about a year ago, when I was too lazy to carry my whole computer to some event due to its size and unease of carrying. When such situation comes up, one starts to think of ways to reduce the weight. The problem with it was the steel computer case, which accounted for about 80% of the total mass, which was no fun. Then it hit me, what I needed was to somehow rip the guts out of my computer, and transport just that. Another problem, circuits are exposed in the motherboard, so if a metal part such as a power supply unit touches the circuit boards when in use, bad things start to happen. When I walked into my closet, I noticed the laundry basket, and got me thinking. This resulted in the following. 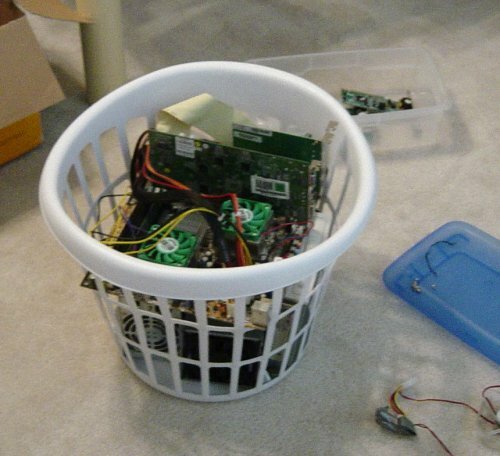 Yes, that’s right, I put my computer in a laundry basket. And suprisingly, it works extremly well. The stuff was put into the case in a very orderly fasion, first the Power supply at the bottom center, then the CD Drive beside it facing up vertically. The two hard drives were placed on the other side of the power supply also vertically. Foam padding was applied between parts as well as the case it self to absorb shock and possible damage. A 80mm fan was also placed next to the hard drives to cool them off slightly, but I dont think that did any good. Placing the mother board was probably the most interesting of them all. The structure of the laundry basket was ideal. Each corner of the mother board was slipped right onto one of these holes, which actually suspended the mother board over all the other components with about a 5cm gap. I was about to leave the gap without anything, but last minute decided to add a block of foam, since this will preven the Power supply unit to bounce up and hit the mother board. Everything was very tightly and nicely fit in. To get the mother board into those 4 holes, the laundy basket had to be sqeezed a little, this was good since now its tightly secured. The only thing I had to be careful about were the PCI Expansion cards and the video card. On conventional computer cases, those are held tightly by a screw to the case, and since the basket case does now have any place to screw those in place, the only thing holding those in place were the PCI slots. 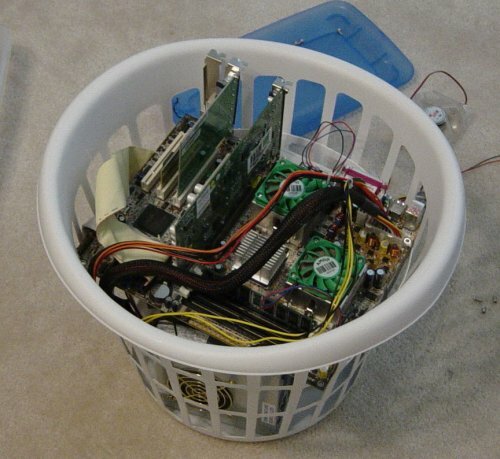 But other than that, it was a fully function server, in a laundry basket. 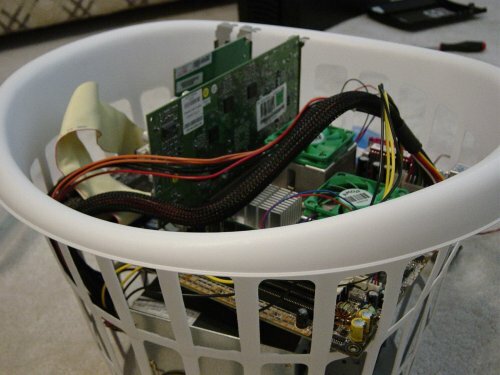 This was probably one of the most simple, yet extremly useful things I have done to my computer. Probably the quickest ideas I have had in a while as well, from idea to finished product, it wouldn’t have taken more than 30 minutes. If a situation ever rises as what I faced, try this, it will make you life much easier.